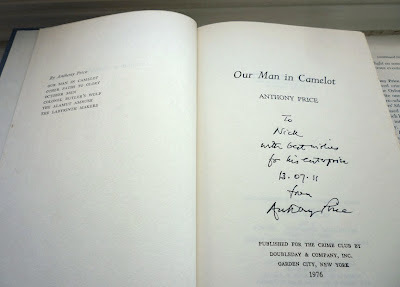 Back in July 2011 I had the pleasure of interviewing spy novelist and journalist Anthony Price at his (then) Oxfordshire home (the interview can be found in two parts here and here). 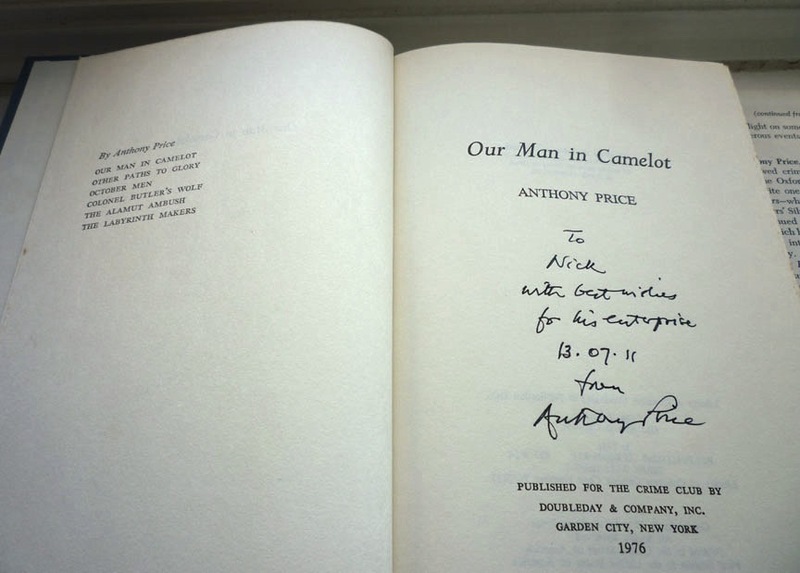 After an hour-long recorded conversation in his study ranging across his life, his book reviewing, his politics and of course his David Audley spy novel series, we retired to the conservatory, where Price kindly signed and inscribed two books I'd brought along (Gollancz firsts of the first two David Audley novels, The Labyrinth Makers and The Alamut Ambush). As we chatted, Price began telling me about an American Air Force pilot who had at one time lived just up the road. 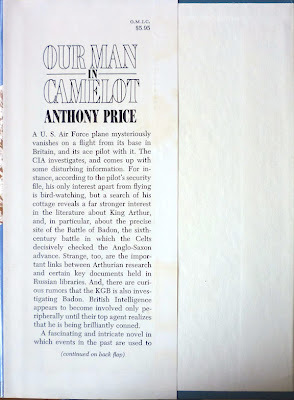 Mid-sentence the author upped and disappeared off to his study, returning with a 1976 US Doubleday first edition of his sixth novel, Our Man in Camelot (originally 1975). 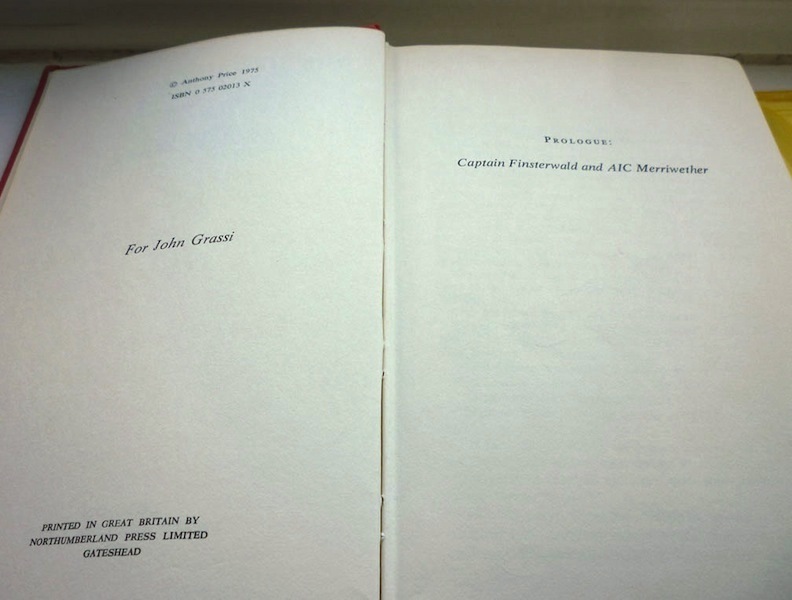 He explained that the book had been inspired by that pilot – that one day he had informed his near-neighbour, "I'm going to write a book about you lot." To which the pilot had replied, rather surprisingly, "I thought you wrote about King Arthur." So Price decided to combine the two strands in one novel. That it's taken me over two years to get round to reading the novel only serves to demonstrate what an ungrateful swine I am – or possibly illustrate how many books I have awaiting my attentions; take your pick – but that's by the by: read it I finally have, and a fine piece of brain-tickling spy fiction it is. Each of the David Audley series novels – those I've read thus far anyway – is related from the perspective of a different character: Audley himself in The Labyrinth Makers (1970); then Hugh Roskill and Major Jack Butler, his colleagues in the Ministry of Defence's Research and Development Section, in, respectively, The Alamut Ambush (1971) and Colonel Butler's Wolf (1972); followed by October Men (1973), which unfurls from the twin viewpoints of Captain Peter Richardson and Pietro Boselli; and Other Paths to Glory (1974), which stars researcher Paul Mitchell. This time the tale is told through the eyes of Captain Mosby Sheldon of the US Air Force, a dentist by profession, stationed in Wiltshire with his wife Shirley and currently sightseeing around the south. At least that's the story he tells Audley and his wife Faith, who are also on holiday in the local area, and whom Mosby assists when their car breaks down. 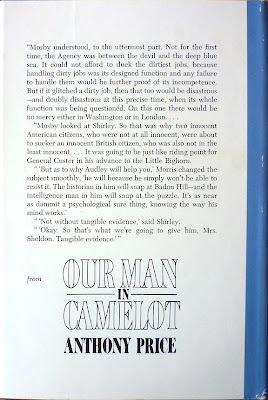 In fact Mosby and his missus (in name only, it transpires) are deep cover agents of the CIA, tasked with covertly enlisting Audley's aid in unravelling the mystery of why a USAF pilot was trying to locate the lost site of a 6th century Arthurian battle, Badon Hill, and whether that had anything to do with said pilot's death in an unexplained plane crash. 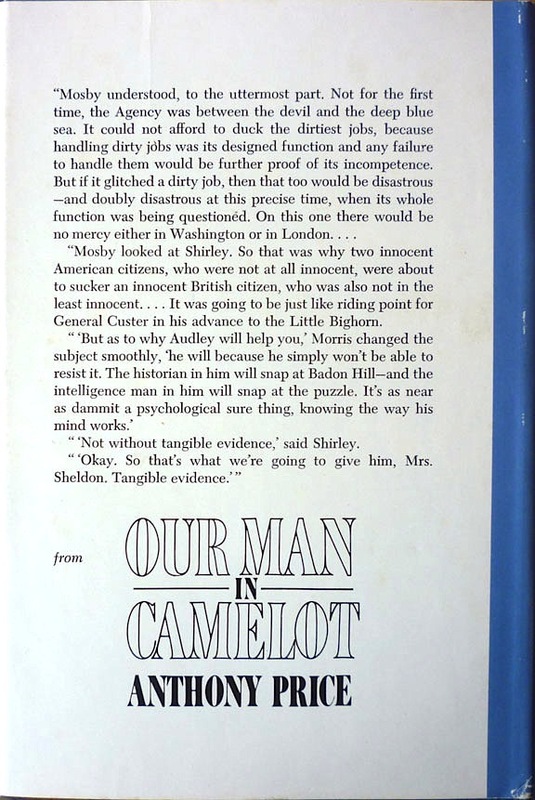 As is by now traditional in an Audley novel, the answers are (eventually) forthcoming largely as the result of chapter-long – sometimes multiple-chapter-long – discussions between the various protagonists, who also include a variety of other CIA operatives and a selection of Research and Development stalwarts, notably the returning Hugh Roskill, plus a new character, Frances Fitzgibbon, who is destined to head up her own novel before too long (Tomorrow's Ghost, 1979). 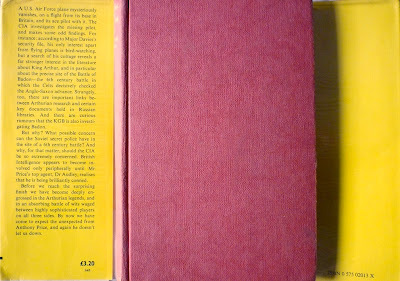 And somewhere in all this is the hand of Soviet spymaster and archaeological expert, the manipulative Nikolai Panin. 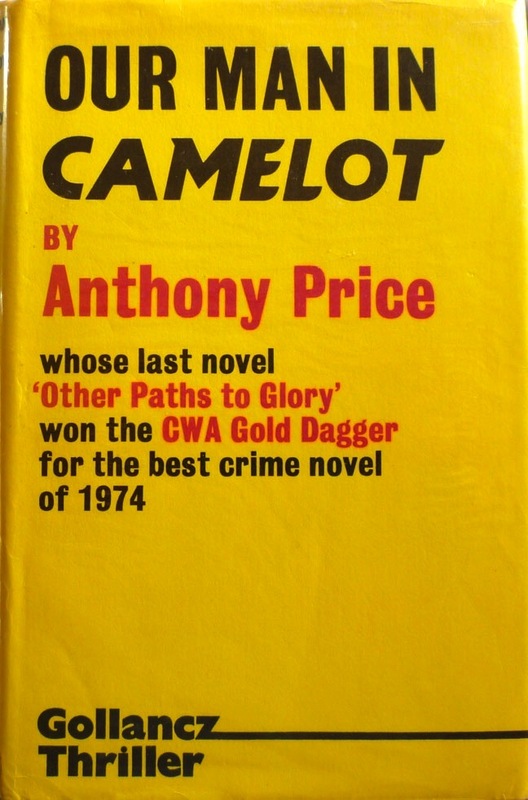 Six books into the series I've become accustomed to Price's agreeable mix of espionage, archaeology, history and detection – and myth and legend in this instance – but that doesn't make the plot of Our Man in Camelot any less perplexing. I spent a fair amount of the book scratching my head wondering what the hell was going on, and even by the denouement, which finds Mosby heading up what he believes to be Badon Hill in the certain knowledge that it will mean his death, I had to reread earlier parts to make sense of the revelations that dawn on Mosby as he tramps up the slope. It's a bit like being at a dinner party where all the guests (except you) are particularly clever and erudite – not that I've ever been invited to such a thing – or many dinner parties at all for that matter – but in any case that's precisely how Mosby himself feels at one stage of the story when he's caught between the piercing intellects of Audley, Audley's archaeologist friend Dr. Anthony Handforth-Jones and their old don Sir Thomas Gracey, Master-designate of the King's College at Oxford. That said, it's a pleasurable sort of perplexity to have to endure, and especially in such beguiling company. For me that Mosby/Audley/Handforth-Jones/Gracey tête-à-tête (à-tête-à-tête) is one of the highlights of the book, although there are other memorable, and less-talky, scenes too, notably a violent encounter in a church graveyard between opposing intelligence agents, the unexpected aftermath of which packs a real emotional punch. 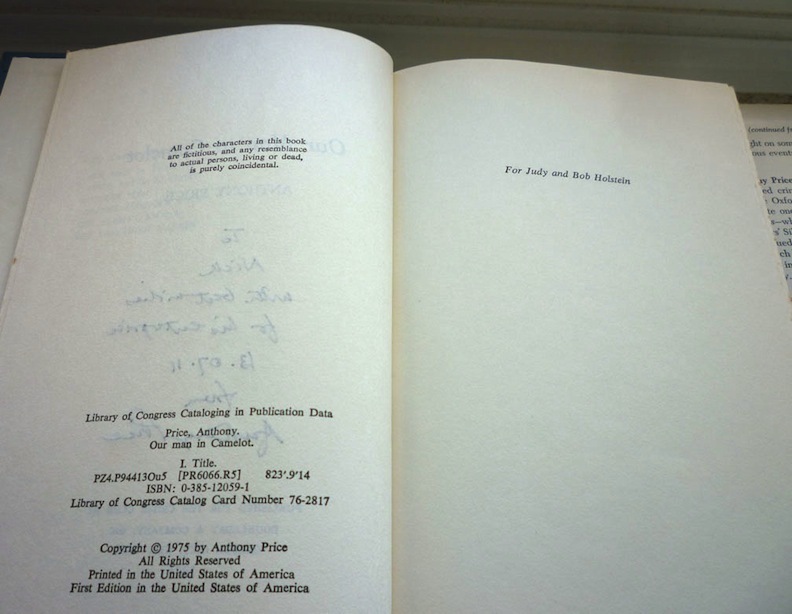 I wasn't recording the conversation at that point, but I believe that's the name of the American airman who lived up the road from Price, and who inspired the writing of the novel. If memory serves, anyway; I've kept up an intermittent correspondence with Mr. Price ever since I interviewed him, sending him print-outs of some of my blog posts (he's not online, and no longer owns a computer either), so I shall have to ask him if and when I send him this one. Next: the Existential Ennui Review of the Year, 2013 edition. 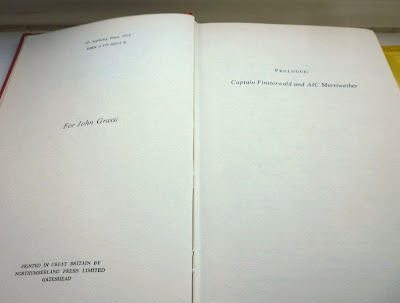 To admit that you had never read Our Man In Camelot is bad enough but then to take two years to read a copy GIVEN to you by the author....Oh, the shame! Take the shame, Nick! Duly taken, Mike. What can I say? I'm just rubbish. Col, let me know how you get on; there are reviews of each of the Price novels prior to this one on Existential Ennui: feel free to leave comments. 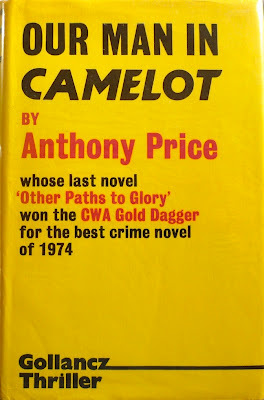 I remember reading the Anthony Price series back when they were first published and they always required complete focus in order to parse the subtleties of his very complicated plots. Quite so, Ron. Thank you for the comment. 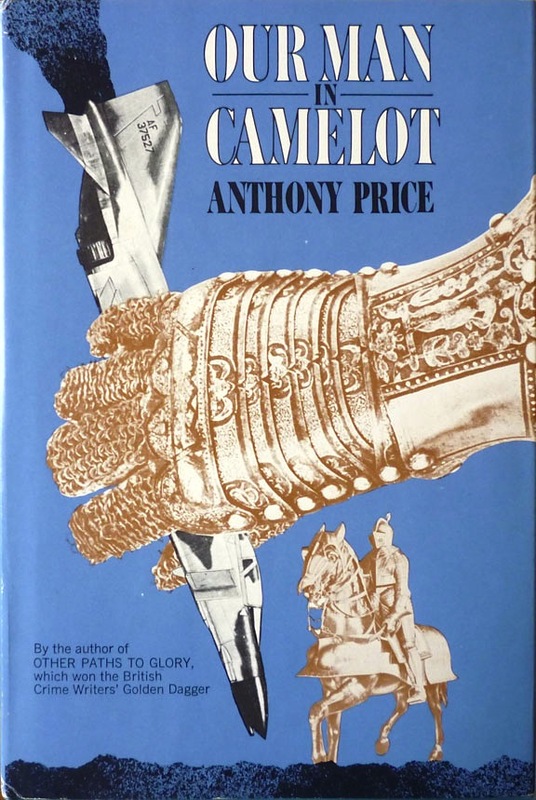 Our Man in Camelot was the first book by Anthony Price that I ever picked up. I am a fan of Science Fiction and Fantasy and was going through a phase where I was interested in the King Arthur legend (I was going through Le Morte d'Arthur), so the title hooked me. The story hooked me even more. 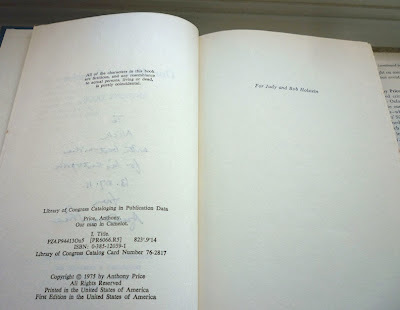 Having an American protagonist made the book that much more meaningful to someone on my side of the pond. Anyway, I have loved Price ever since and reread his books every few years. Don’t know if you’ll pick this up but do you think that some of the plates with Russian interference are starting to sound modern. E.g. ted allbuery 20th day of January?